California has been dealing with record breaking fires for the past month and they aren't even halfway through their fire season. The Mendocino Complex eclipsed last year's Thomas fire which burned 283,800 acres last December 2017 in Ventura and Santa Barbara. Besides the huge and horrifying Mendocino Complex, there are four other extremely large fires consuming large swaths of the state as well. The Carr fire, the Donnell fire and the Ferguson fire are all taking their toll on the state. Credit: NASA image courtesy of the NASA/Goddard Space Flight Center Earth Science Data and Information System (ESDIS) project. Caption by Lynn Jenner with information from Inciweb and CAL Fire. California has been dealing with record breaking fires for the past month and they aren't even halfway through their fire season. The Mendocino Complex eclipsed last year's Thomas fire which burned 283,800 acres last December 2017 in Ventura and Santa Barbara. Besides the huge and horrifying Mendocino Complex, there are four other extremely large fires consuming large swaths of the state as well. The Carr fire, the Donnell fire and the Ferguson fire are all taking their toll on the state. The Mendocino Complex now firmly in the number one spot for largest fire in California history is at 290,692 and is only 34% contained. This complex consists of two separate fires, the River Fire and the Ranch Fire. The River Fire is located northeast of the community of Hopland, and the Ranch Fire is located northeast of Ukiah, in Lake County and Mendocino County, California. The Ranch Fire is actively burning in the Mendocino National Forest north of Clearlake. This complex started on July 27, 2018 and the cause of the blaze in under investigation. There have been 75 residences and 68 other structures destroyed. Nearly 4,000 fire personnel are working this inferno at present. Extreme torching, flanking and spotting have been observed with this complex and both fires continue to have rapid growth when aligned with fuels, topography, and wind. High temperatures, low humidity, and afternoon winds coupled with critically low fuel moistures are contributing to large fire growth. The forecast hot, dry and windy weather pattern developing today coupled with extremely dry fuels and challenging terrain will continue to produced extreme rates of spread. The Carr fire has burned 167,113 acres and is 47% contained. This fire is north of the Mendocino Complex in Shasta and Trinity Counties. The cause of the fire was from a mechanical failure of a vehicle. Two firefighters have lost their lives fighting this blaze. There have been 1,077 residences, 22 commercial structures, and 500 outbuildings that have been destroyed by this fire. There are still 1,806 structures that are threatened. The total number of firefighter personnel at this blaze is 4,738. The fire is located in steep drainages with varying wind exposure which is challenging firefighting efforts. Firefighters will continue constructing containment lines and mitigating spot fires across control lines. This fire began on July 23, 2018. The Ferguson fire is located right outside of Yosemite National Park. The fire is currently 94,331 acres in size and is 43% contained. Ferguson grew by 2,829 acres throughout the day. There are 2,357 personnel that are currently engaged on the fire. There have been 2 fatalities and 11 injuries to date and 0 structures have been destroyed. The Ferguson Fire is now the largest fire in the Sierra National Forest's History. This fire began on July 13 and is now in its 26th day. Firefighters will take advantage of another day of moderate fire behavior. The moderate fire behavior is indicated by the lack of vertical movement of air reducing the wind speed, solar heating, and spot fires. Halting the spread of the fire into the Yosemite National Park and securing the communities of Foresta and Yosemite West remain the priorities for firefighters. The Donnell fire located north of the Ferguson fire began on August 01, 2018 and its cause is unknown and under investigation. The fire is already 13,200 acres and is 2% contained. There are 410 firefighter personnel on this fire. There are 1,120 structures threatened and 235 structures have been destroyed. The fire is burning primarily along the north bank of the Middle Fork of the Stanislaus River in steep and inaccessible terrain with heavy standing dead and down timber. Due to the other large fires in the region and state, firefighters and equipment are extremely scarce. The fire spread minimally with no substantial acreage growth today due to the inversion layer which kept the winds much lower than previous days. However, air resources were unable to assist firefighters with water drops. Across the entire state is a blanket of smoke. The air quality in much of California is moderate to hazardous depending on proximity to the fires, however, there are very few areas in the entire state that are not being affected by the smoke coming off the fires throughout the state. The EPA's AirNow website gives a roundup of the air quality indexes for the state here: https://www.airnow.gov/index.cfm?action=airnow.local_state&stateid=5 The smoke released by any type of fire (forest, brush, crop, structure, tires, waste or wood burning) is a mixture of particles and chemicals produced by incomplete burning of carbon-containing materials. All smoke contains carbon monoxide, carbon dioxide and particulate matter or soot and is hazardous to breathe. 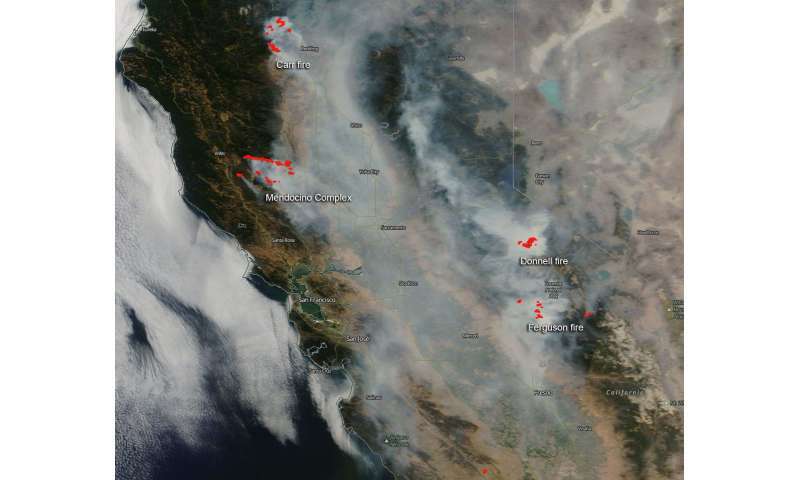 NASA's Aqua satellite captured this image of the fires and smoke blowing from them on August 06, 2018 with the Moderate Resolution Imaging Spectroradiometer, MODIS, instrument. Actively burning areas (hot spots), detected by MODIS's thermal bands, are outlined in red. Each hot spot is an area where the thermal detectors on the MODIS instrument recognized temperatures higher than background. When accompanied by plumes of smoke, as in this image, such hot spots are diagnostic for fire. NASA image courtesy of the NASA/Goddard Space Flight Center Earth Science Data and Information System (ESDIS) project. Caption by Lynn Jenner with information from Inciweb and CAL Fire.